Cần Giờ Biosphere Reserve (Khu dự trữ sinh quyển rừng ngập mặn Cần Giờ) is a wetland located 40 km southeast of Ho Chi Minh City. This reserve has been listed the biosphere reserve by UNESCO. The site is an important wildlife sanctuary in Vietnam as it is characterized by a wetland biosystem dominated by mangrove and many rare species. The forest's area is 75,740 ha, with over 150 botanical species. The major habitat types found at Can Gio are plantation mangrove, of which there is about 20,000 ha, and naturally regenerating mangrove, of which there is about 7,000 ha. Moreover, a total of 18 mollusc, 27 crustacean, 45 fish and three amphibian species have been recorded at the site. Saltwater crocodiles used to live in the wild here and now are living in protected area. Also, Dugong have been reported to occur seasonally in seagrass beds at the site, although these reports have not been confirmed. The intertidal mudflats and sandbanks at the biosphere reserve are an important habitat for migratory shorebirds. The mangrove forest at Can Gio performs many valuable ecological functions, including coastal stabilisation, and protection against coastal erosion, oil spills and storm surges. 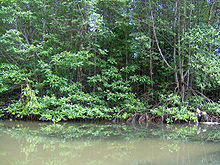 The mangrove forest is a source of fuel wood and construction materials.